Picture Jasper - Rock Tumbler Rough - Scenic! This photo shows some of our rough picture jasper. The rough in the photo above is wet to show full color. This is a beautiful brown, tan, grey, cream and blueish gray jasper that yields interesting pictures and desert scenes when tumbled. We always enjoy opening the barrel at the end of a tumble to see what types of scenes have developed. The gemstones remind us of our trips to Utah and Arizona! We recommend TXP polish - an aluminum oxide compound - for polishing this picture jasper. 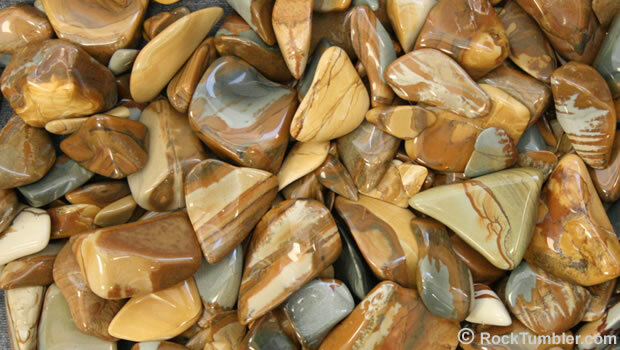 This Picture Jasper rough ranges in size from approximately 3/8" (9 mm) to 1 1/2"" (38 mm) in diameter. This picture jasper has been crushed and sized to perform well in small rotary tumblers such as the Thumler's MP-1, A-R1, and A-R2. The size range gives the material a good tumbling action and eliminates the need for ceramic media. Our EASY Rock Tumbling Recipe works well for rough that has a Mohs hardness of 7 and has been crushed to a variety of particle sizes under about 1 1/2 inches.